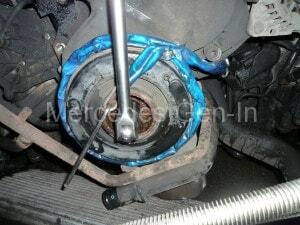 Here is a post describing the DIY replacement of the timing belt, water pump and idler pulleys on a 2007 Volkswagen Crafter CR35 Van. 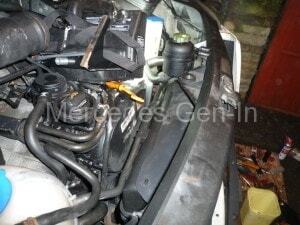 (Same body as Sprinter) Timing belt replacement at 12,000 miles or 48 months (though personally I think every 80,000 miles is perhaps a safer bet for hard driven commercial vehicles) The post describes how to remove the radiator without removing the complete front section of the vehicle, allowing the timing belt components and water pump to be changed with minimal fuss. 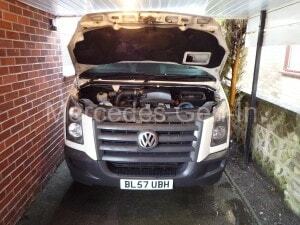 This method will only be suitable for VW Crafter CR35 5 cylinder 2.5l CDI without Air Conditioning. Open the bonnet and begin the task… The first thing that has to be done is to remove the grille, this is done by removing the line of screws on the top edge, lever it carefully forward and unclip it upwards from the 2 tags at each lower corner. Remove and place somewhere where it wont be damaged. Now remove the air box by pulling up on the front fixings, detatch the intake pipe clamp LHS and release the intake before lifting up and removing the complete air box. Remove and store the oil dipstick. Next remove the central lower plastic grille, and bumper step by undoing the two torx fixings on the step top and working your way around the grille section edge unclipping the securing tags and pulling gently forward until all clips are free, pull forward the compete unit and release it from the surrounding moulding. Although removed on my photographs, neither of the metal headlamp grill fill-in trims need be removed, these were taken off to replace the damaged wing clips and not replaced until final build up. Unscrew the RHS plastic trim that covers the exit of the twin oil cooler alloy pipes and air intake aperture, unscrew the cooler loop attachment on the LHS and let the oil cooler float free (be aware this bends and damages easily) Undo the two 50mm long torx screws that hold the intercooler to the radiator base. These are located at the very bottom corners of the radiator. Let the intercooler fall down below the rad on its pipes. Now release the clip on the power steering reservoir and lift it upwards, undo the three torx screws holding it to the slam panel, one is accessed through a hole, now remove the bracket. Undo the single torx fixing on the coolant reserve and lift it free of the slam panel/front panel, fold it back on its pipes to lay out of the way in the engine bay. 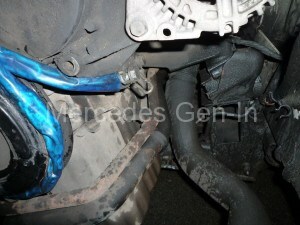 Now remove the coolant hoses from the radiator, draining the system as you go. 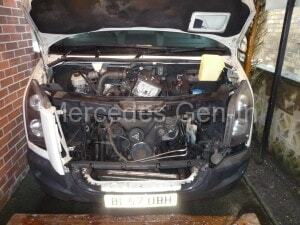 Remove top hose LHS at radiator, bottom hose LHS from the engine spigot underneath van, NOT at the radiator itself. Now remove the reservoir small pipe RHS. Unclip this pipe from the top of the radiator cowl and fold it out of the way. 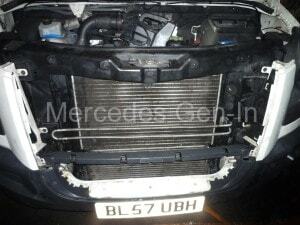 Remove the plastic corrugated air deflector from on the top of the radiator/fan housing. 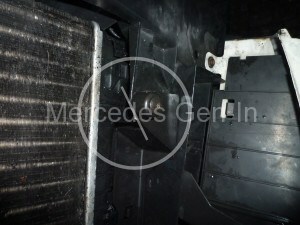 Identify the 4 tabs on the fan cowling/housing that interlock into the radiator, 2x RHS and 2x LHS. Lever the plastic moulding on each locator and pull the cowling upward about 2 inches to release it from the radiator. Jiggle it toward the engine as much as possible to maximise available clearance. Identify and release the 2x clip fix points of the radiator on the upper tank side sections, once released push the radiator the allowed ‘very’ small amount away from the front panel toward the engine. Now take a hacksaw blade and carefully cut the following four small key sections from the front panel in the areas shown. 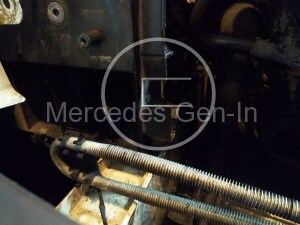 This enables the radiator to be removed from the front without taking off the complete front end of the vehicle. Slice the lower part of the front panel web just below the radiator fixing clip in point on the RHS. Remove the small cut portion of the web section completely. The lower tabs on the radiator that have just been released will now pull through the slots you have cut and the whole radiator will drop down outward at the bottom. Pull gently the RHS a little further out from the front panel, you may have to jiggle the oil cooler pipes a little to do this, once out from the confines of the RHS front panel lip, push back and guide the radiator on the LHS inwards slightly towards the engine. This will then allow full clearance to drop the radiator clear and out of the front panel lip on the top LHS. Now the radiator is out you can remove the fan cowling and undo the single hex bolt from the centre of the viscous fan. Just use a long series allen/hex key and strike it anticlockwise with a hammer to undo. 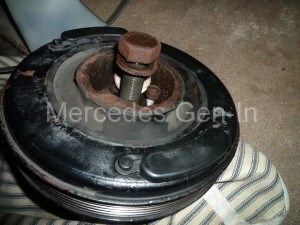 Once this single pin is removed the fan can be lifted out from the fan pulley. 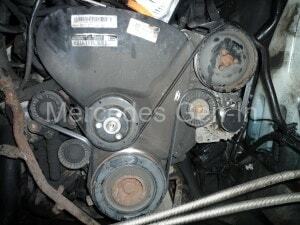 At this point you may want to note how the auxiliary belt routes round the various pulleys. Here is a photo just in case your belt is broken for future reference. The next job is to loosen the three 10mm bolts on the fan pulley, once this is done tension can be eased with a pry bar from the aux belt tensioner (Far right on above photo)and the belt slipped off and removed. Now fully remove the fan pulley. Behind you will see 3x 17mm x 100mm pins that hold the complete belt tensioner pulley/idler set and supporting hub for the fan pulley to the engine block. Once these are removed the whole three pulley assembly can be removed wholesale and stored out of the way. Now the RHS idler can be removed giving full access to the timing cover – except for the removal of the crankshaft pulley! Crankshaft Pulley / Vibration Damper – This is a ‘beast’ to remove and can only be removed with the correct locking tool or this makeshift rig. Use the chain routing as shown and attach the end of the chain to the forward alternator mounting bolt (substitute one of the tensioner assembly bolts temporarily to fix the chain in this location as they are slightly longer and will allow a little more thread engagement. First undo or at least slacken the four star head fixings to the vibration damper/crank pulley centre. Now use a breaker bar and remove the crankshaft bolt – it will be mega tight! Once removed tap the pulley from the end of the camshaft. 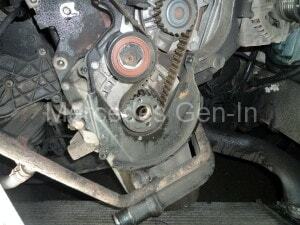 Watch for a thin shim that is between the pulley and crankshaft boss on removal. Always use a new centre bolt on reassembly. 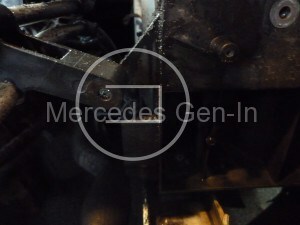 Remove the steel shield from the timing cover (3x 10mm pins) unclip the plastic upper section to reveal the timing belt. Use tippex and mark the belt position (mark pulley and belt with corresponding marks) on the two upper pulleys and also the crankshaft toothed pulley. Check the markings are clear and unique then slacken the cam belt tensioner and remove the belt. 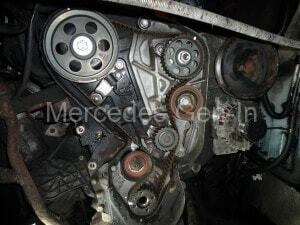 If you need to replace the water pump now is a good time to do it, it is best to do it as a matter of course when replacing the timing belt as its a huge job to do again at a later date. If you are removing the pump undo the 3x fixings and jiggle it from behind the upper timing back shield lip. Fit the new pump using the supplied new O ring seal and some gasket compound to hold the O ring in place while you reposition the pump behind the upper timing shield. 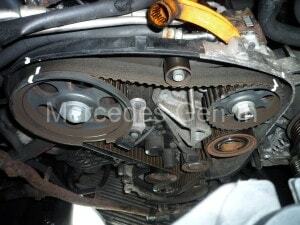 Once the pump is fitted and tightened you can now begin to fit the new timing belt kit. Mark the new belt in an identical manner to the old one. Check your work as this part is critical to the timing being correct on rebuild. 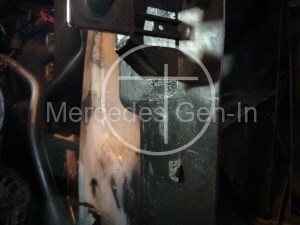 Slip on the new belt over the pulleys and tensioner, check your alignment of markings. Now place a spanner on the crankshaft bolt and rotate the engine slightly anti-clockwise to take up the slack in the belt on the non-tensioner side. When you have done this tension the belt correctly on the tensioner by rotating the outer eccentric cam on the fixing bolt to get the pointer on the tensioner to about mid position on the pointer marker, tighten the tensioner bolt and apply clockwise then anticlockwise rotational tension to the camshaft pulley and check the range of tension. Use this old method to just satisfy yourself and then double check your work before refitting the covers and beginning to rebuild the engine. Rebuilding the components is an exact reversal of removal, with just a couple of notes. Feed the bottom hose of the radiator into its correct route between the intercooler hose before you ease the radiator back into position, jiggle the radiator in first at the LHS, up and back, then feed in the RHS. Move it all upward inside the front panel, then down into its locators, clipping it in at the top once in its home position. Be aware that when refilling with coolant make sure the required strength of antifreeze is used as the reservoir level sensor has an integral hygrometer to measure antifreeze strength. Even if you have the correct level of water in the system, if it does not have the correct ratio of antifreeze it will still indicate a dashboard warning! Tightening the crank pulley bolt can be done by using the same chain method although for £70 if you are able to afford to purchase the correct Laser branded locking kit, it contains the custom lock tool for a 3/4 drive breaker bar. (Laser tool part number: L4638) Crankshaft bolt tightening torque is 160nm plus 180 degrees OOooof! If you are a competent DIY’er with a reasonable kit of tools you should be able to complete this task in well under 6 Hours (with tea and snack breaks). Its well worth the trouble, as VW commercial dealerships quote circa £700 plus vat for a timing belt job without water pump! I hope you found this useful as there is little to no information on the web describing this process. Would you have any other useful info. on the Crafter that could be helpful to myself in looking after/maintaining this beast for years to come? The Crafter is pretty much the same beast as the later Sprinter, and there is a great deal of crossover from the older model so running gear is more or less identical, brakes springs, handbrake, axle, gearbox etc. The only difference being the engine and the tools you need to access the electronic management system. As time progresses more will be added as I am maintaining a CR35 LWB for a client. As jobs of interest come in I will be listing them. great write up . the air con model is a arse of a job due to having to undo the slam panel as well to leaver it forwards to remover the rad. Not at all Simon, the diesel pump is just that, the system uses common rail electronic injector control.